"NASA's next Mars rover will land at the foot of a layered mountain inside the planet's Gale crater. The plutonium powered car-sized Mars Science Laboratory, or Curiosity, is scheduled to launch late this year and land in August 2012. The target crater spans 96 miles (154 kilometers) in diameter and holds a mountain rising higher from the crater floor than Mount Rainier rises above Seattle. Gale is about the combined area of Connecticut and Rhode Island. Layering in the mound suggests it is the surviving remnant of an extensive sequence of deposits. 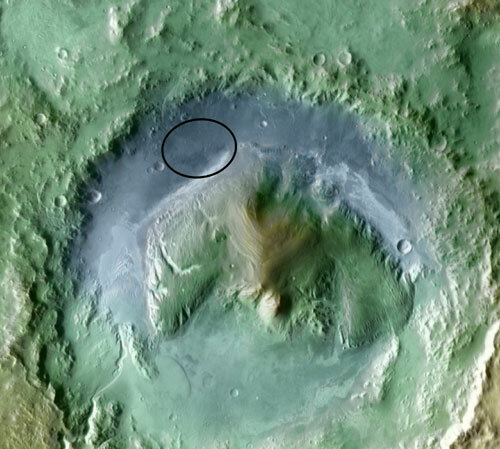 The crater is named for Australian astronomer Walter F. Gale. During a prime mission lasting one Martian year -- nearly two Earth years -- researchers will use the rover's tools, including a laser beam, to study whether the landing region had favorable environmental conditions for supporting microbial life and for preserving clues about whether life ever existed."